Helen Langwick produced a player of the match performance for Batley. Batley Ladies suffered a narrow 1-0 defeat away to Adel Fourths in Yorkshire Hockey Association Division Four North last Saturday. Batley knew they were in for a tough match against a fast and strong Adel side, who were well organised and played the ball around skilfully. Batley weren’t outplayed though, closing down the Adel attacks and making breaks forward of their own. It was end to end stuff with both teams getting chances to take the lead. Batley goalkeeper Helen Langwick was facing her first real challenge of the season and was forced into making a fine save following a deflection off one of her own team, which helped keep the game scoreless going into half-time. Adel were out quickly on the attack in the second half and caught Batley on the back foot gaining a couple of quick penalty corners. Batley’s defence kept them at bay closing down the strikes and Langwick continued to make further great saves. Adel were attacking high up the pitch, pushing Batley to defend very deep, which meant they struggled to force attacks of their own. Batley continued to battle and produced some good fast breaks and dangerous runs into the Adel circle. Langwick produced another terrific save from a strong shot from the top of the circle but the rebound was lifted in as Batley fell behind with 10 minutes remaining. Batley didn’t stop pushing in an attempt to find an equaliser in the last few minutes, but they were unable to break a solid Adel defence as the home side held on to seal a hard-fought victory. Player of the match went to Helen Langwick for some awesome saves. 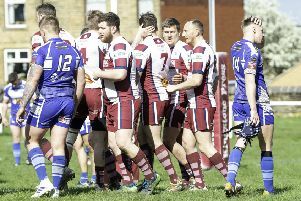 Batley entertain local rivals Cleckheaton this week, with their opponents searching for their first win of the season having draw four and lost four of their eight games.